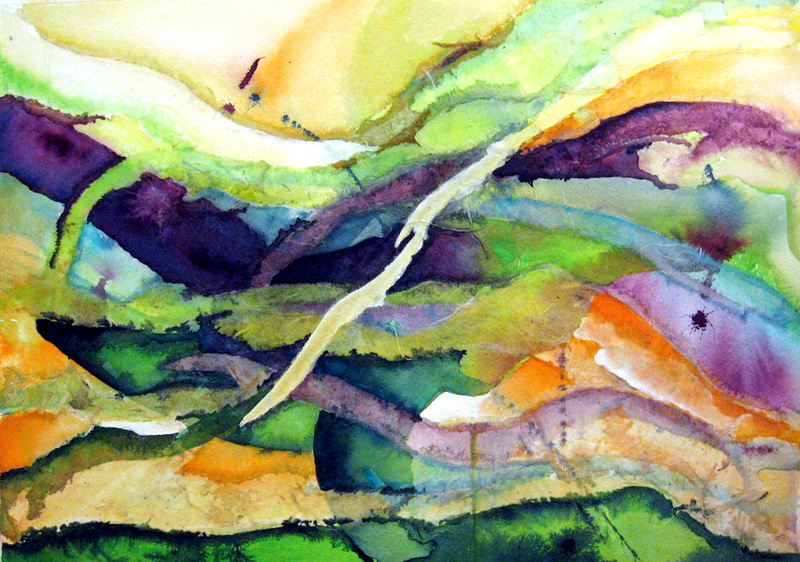 The above painting was created by using watercolor in conjunction with rice paper collage. 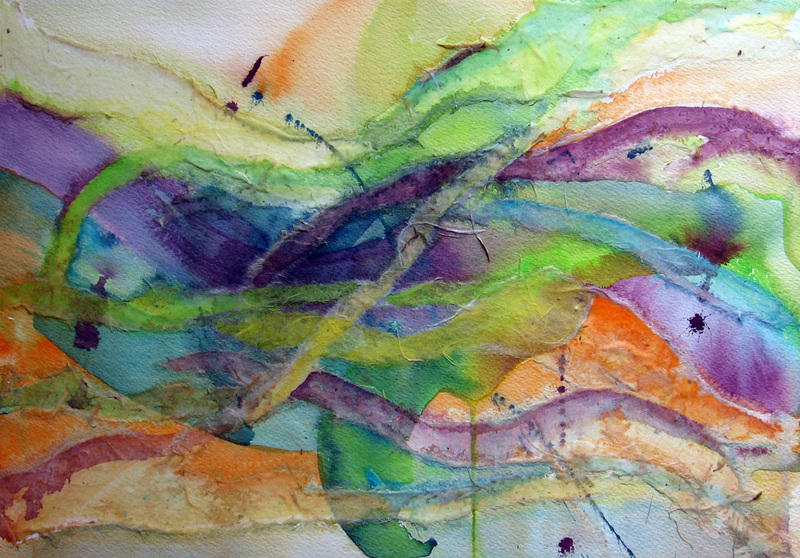 My watercolor students are currently exploring the use of rice papers in their paintings. For the first exercise, we painted a cruciform design on our paper. 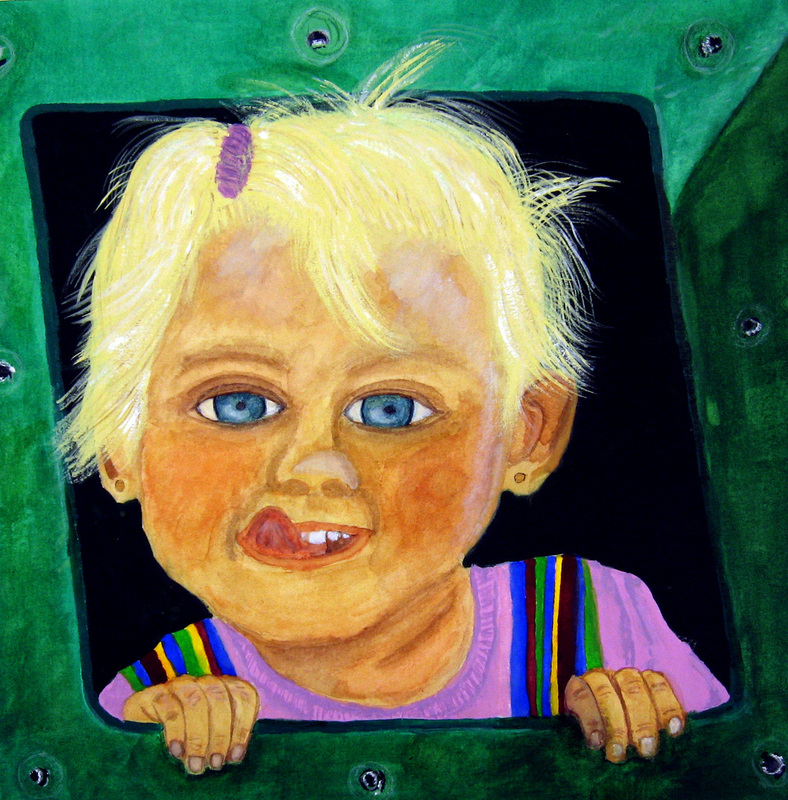 This is an exercise that Gerald Brommer suggests in his book Watercolor and Collage Workshop. The image, above, is my initial cruciform design. He tells us we can splatter, work wet-in-wet, and make small and large marks. One thing we needed to watch out for is to try to not “muddy” our colors in this stage. We waited for this intial design to dry before going on. If we were in a hurry this phase can be dried with a hair dryer. We, next, tore or cut pieces of textured manila and white rice papers and affixed them to our initial design using a glue we mixed ourselves. We used 4 parts acrylic matte medium with 1 part water as our glue. Use old brushes to brush the glue onto the paper (less is more) and then apply them to your composition in an interesting pattern. Cut pieces of rice paper would appear to be more man-made structures and the torn pieces looked more like forms in nature. I have learned, from experience, that I need to be very careful to not brush the glue off the rice paper and onto the adjacent areas of watercolor paper as this changes the way my pigment lays on the paper. Some rice papers are so thin that I can lay them on the surface of the watercolor paper and stroke the topside of the rice paper with my glue brush. 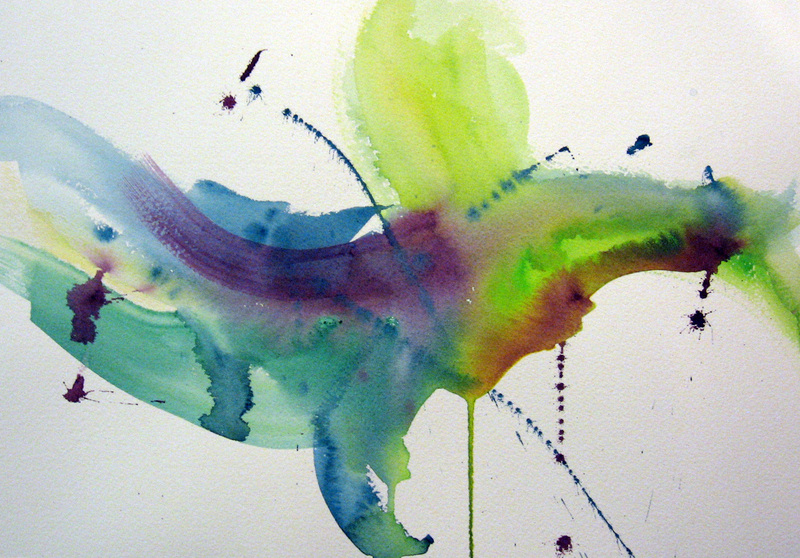 The glue seeps through the porous paper and adheres that to the watercolor paper below. I then stroke gently and lift the excess glue from the top of that piece of rice paper. Once my pattern of glued papers is dry, I again paint into my design. I concentrate on colors that will not create “mud”, often using the colors I used in the initial design. I may, after the pigment is dry, incorporate more rice papers. Sometimes the values are not clear and the artist needs to use more papers to rescue the light values again. I decided my composition, above, fell into that category. To finish my piece I used permanent white gouache to accent areas of lighter value and went in with my original darks and accented the shapes I wanted to darken with them. I thoroughly enjoy working with watercolor and collage in this way. It frees me from being tied to reference material and allows for self exploration of texture, value and color. I create these with nothing in mind other than what the paper and pigment direct me to do as they mix and form in front of me. Two other examples of this technique can be found here and here. The above painting was painted by a student in my Creative Challenge class. This class covers general composition as well as a summary of how to approach composition in regards to portraits, landscapes and still life subjects. We discuss shape, line, value, texture, color, space and how to find and develop a center of interest. We devote one night to the topic of how to attract the viewer’s attention. If you would like to view all the students’ work from this class, you can find it by visiting the Student Art 2 page or by clicking here. I promised Alonso, if I finished this, I would post it. The above painting was drawn a couple nights ago on Arches 140lb Hot Pressed paper. Why hot pressed for such a textured scene? Oh, you know; just to see if I could do it. 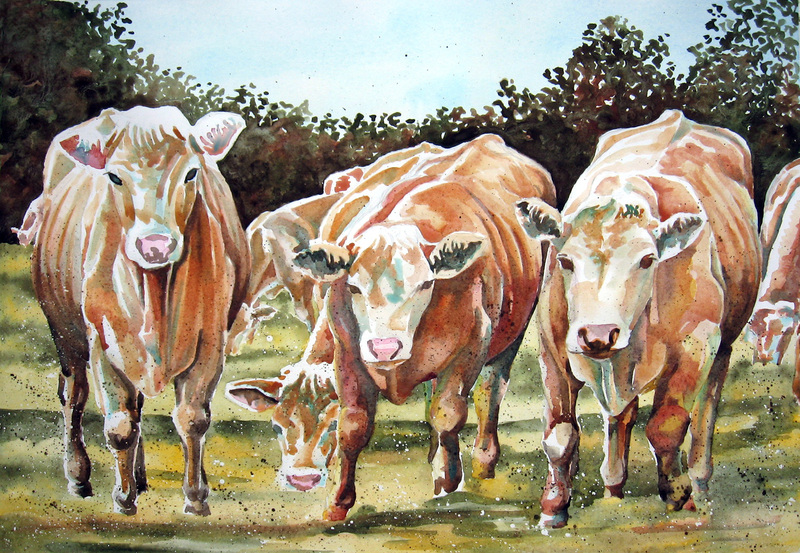 I found another splotch of time to paint the cow on the far right and some of the one next to him, but then off to other things that must be done. I was able to get classes taught and student artwork posted and had a FREE NIGHT last night! I decided to paint this scene. I was about an hour in and the electric went out. 50 MPH winds we were having. Angered by this change of events, I lit two candles and held a flashlight and painted away in the dark. I know. I know. I know. Artists are not to paint in the dark. I think if I waited for everything to be perfect in my life I’d never create anything. So, this is my candlelight painting. Cows, no less. As I painted, my anger began to subside and my thoughts wandered to people who had suffered much more and I was humbled. Many lost their homes in these storms that tracked across the midwest the last two days. Some lost their loved ones. My condolences to all of you.